one energu-efficient computer at atime. Believe it or not, the average desktop PC wastes nearly half the power delivered to it. Half! This wasted electricity unnecessarily increases the cost of powering a computer, and it also increases the emission of greenhouse gases. Improving the energy efficiency of computers is a cost-effective way to reduce electricity consumption and the emission of greenhouse gases that contribute to climate change. 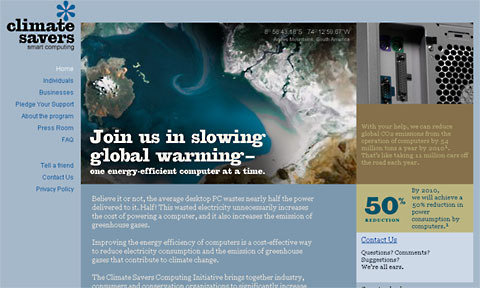 The Climate Savers Computing Initiative brings together industry, consumers and conservation organizations to significantly increase the energy efficiency of computers and servers. "